IMAGINATION! #13 Act Over (38) 11 should be delighted to have you inform Mr. Wilson publicly, re the table he offered to exchange for the graoning one to which I was allergic (one g), that I would be pleased to accept an operating table from him, express at the new address. My motives are of the very best, I swear. I've been intending to have some people in for dinner for just ages. ~~ The fan letters you published in September were awfully interesting. The magazine has more finish and sparkle every month. I have decided that it must be a gigantic undertaking to keep us fans panting for more, each issue. For example here I am losing weight waiting for the sequel to Hollerbochen's Dilemma, as well as the big Contest Number. ~~ Later: Just having learned the sad news of poor Madgo's sentence, I have to add my moans to the rest. It really is a pity that such a flourishing young literary publication should have to stop. I can guess some of tho emotions that are seething around in your heart over it too. Remember tho that you have done a splendid thing in a triumphant way, ~~ Here I am - getting soggy over it—Anyway—-my sympathies. Isaac Asimov 174 Windsor PI. Bklvn, NY addresses "Editor, IMAGINATION! Dear Sir: Enclosed you will find ten cents in stamps for which I wish you to send me the latest copy of your excellent fan-magazine, IMAGINATION! ~~ If there is to be a new issue published within a week could you kindly send me that one? If not, the current issue will do. I would also like to find out the approximate publishing date of your magazine as I intend to be a fairly regular subscriber from now on." (Madge was wont to appear first of each as dated.) RAY CUMMINGS SENDS FOR SAMPLE COPY! 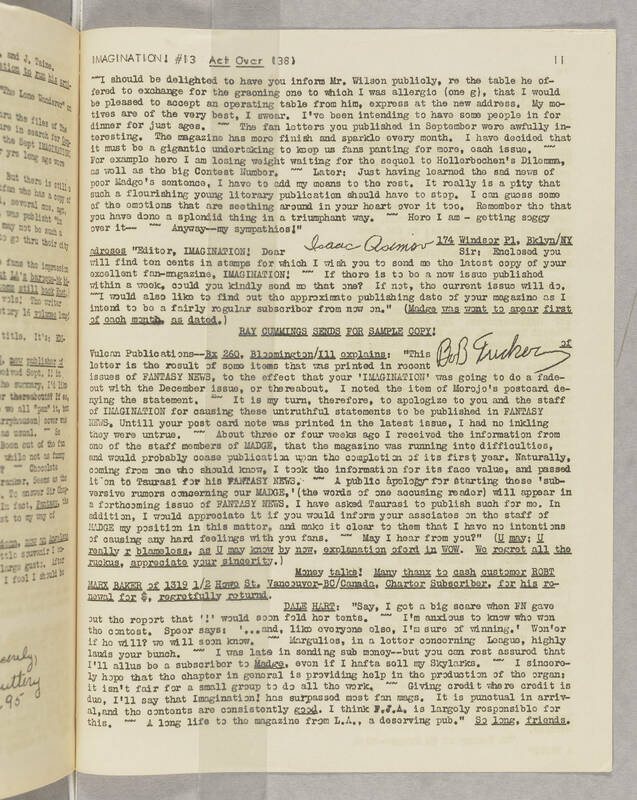 Bob Tucker of Vulcan Publications~Bx 260, Bloomington, lll explains: "This letter is the result of some items that was printed In recent issues of FANTASY NEWS, to the effect that your 'IMAGINATION!' was going to do a fade-out with the December issue, or thereabout. I noted the item of Morojo's postcard denying my statement. It is my turn, therefore, to apologize to you and the staff of IMAGINATION for causing these untruthful statements to be published in FANTASY NEWS. Until your post card note was printed in the latest issue, I had no inkling they were untrue. About three or four weeks ago I received the information from one of the staff members of MADGE, that the magazine was running into difficulties, and would probably cease publication upon the completion of its first year. Naturally, coming from one who should know, I took the information for its face value, and passed it on to Taurasi for his FANTASY NEWS.- ~~ A public apology for starting these 'subversive rumors concerning our MADGE,' (the words of one accusing reader) will appear In a forthcoming issue of FANTASY NEWS. I have asked Taurasi to publish such for me. In addition, I would appreciate it if you would inform your associates on the staff of MADGE my position in this matter, and make it clear to them that I have no intentions of causing any hard feelings with you fans. ~~ May I hear from you?" (U may; U really r blameless. as U may know by now, explanation oferd in WOW. We regret all the ruckus, appreciate your sincerity.) Money talks! Many thanx to cash customer ROBT MARX BAKER of 1319 1/2 Howe St. Vancouver-BC/Canada. Charter Subscriber, for his renewal for $, regretfully returned. DALE HART: "Say, I got a big scare when FN gave out the report that 'I' would soon fold her tents. ~~ I'm anxious to know who won the contest. Speer says: '...and, like everyone else, I'm sure of winning.' Won'er if he will? We will soon know. Magulies, in a letter concerning League, highly lauds your bunch. I was late in sending sub money—but you can rest assured that I'll always be a subscriber to MADGE even if I hafta sell my Skylarks. ~~ I sincerely hope that the chapter in general is providing help in the production of the organ; it isn't fair for a small group to do all the work. ~~ Giving credit where credit is due, I'll say that Imagination! has surpassed most fan mags. It is punctual in arrival, and the contents are consistently good. I think F.F.A, is largely responsible for this. A long life to the magazine from L.A., a deserving pub." So long, friends.